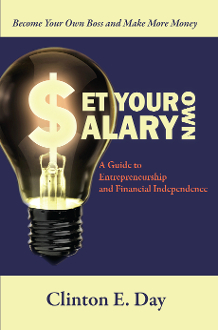 Set Your Own Salary contains the latest thinking in entrepreneurship education, Lean Startup methodology, and a time-proven business blueprint that will lower the risk of a new venture called the “high percentage model.” A fun read, this book intersperses the principles of entrepreneurship with entertaining stories about successful entrepreneurs (Michael Dell, Bill Gates, James Dyson, Henry Kaiser, Fred Smith, the Wright Bros., and others). In these pages you will find a winning formula for self-employment, learn from the experience of other entrepreneurs, and discover the best methods to start a new venture. Follow these guidelines, stay the course, and you will be rewarded beyond your dreams with financial independence and personal satisfaction. • Why desire is the starting point and how to create it. • Where to find ideas and how to think outside the box. • The high percentage model (HPM) to increase your odds. • Risk is part of life, but it can be minimized. • The hottest thing in entrepreneurship: the Lean Startup. • To use these tools of entrepreneurship for an easier launch.